With no mention of the pending destruction of the Provincetown Playhouse or any outline of NYU’s history of disregard for its West and East Village neighbors – as it plants its flags seemingly everywhere – the article feels incomplete. Yet the writer, S. Jhoanna Robledo, does get some choice quotes and information from Alicia Hurley, NYU’s vice president of government affairs and community engagement. 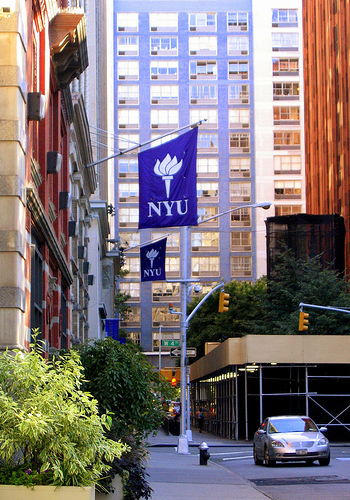 In February, NYU “unveiled its plan for 6 million square feet of new space, half of it housing” for their 23 year plan, Plan 2031. The university’s plan is to add of much of this in downtown Manhattan – for the convenience of its students and faculty. As recently as June, NYU announced plans to destroy basically all of the Provincetown Playhouse and adjoining buildings, except for four walls and the theater entry facade, despite overwhelming community opposition. So where’s the sustainability? New York Magazine article here. Previous coverage of Provincetown Playhouse (including its history) and Community Board 2 vote in support of NYU’s plans despite overwhelming community opposition. If you missed the post about NYU President John Sexton‘s ‘up-is-down’ recent testimony at the NY City Council term limits hearings, click here. Did you fill out the New York City Parks Department “Public Opinion” Survey?